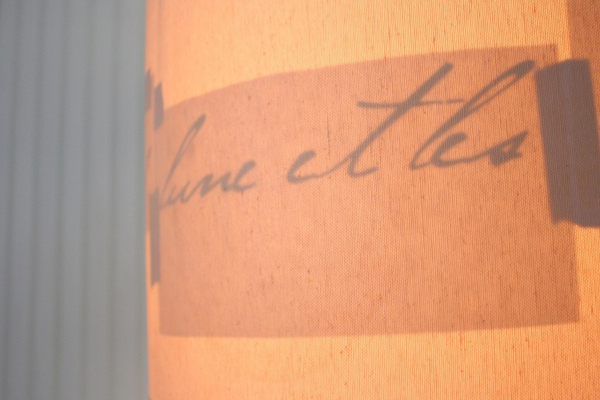 This Love Letter Lamp has been one of the most popular projects I’ve ever posted on the blog. It’s a simple way to give a thrift store lamp a pretty makeover with just a little paint in about an afternoon. Once upon a time there was a lamp that I loved at Pottery Barn (but now neither the lamp or the shade is available). And together, the pair was $159. Kinda pricey for a lamp if you ask me. But I can always find a cheaper alternative! With a little thrift store luck, I found this lamp for $7 and the shade for $2 – so grand total of $9 on both pieces. That price is much better, huh? So let’s turn it into the Pottery Barn inspired Love Letter Lamp. This post contains affiliate links for your convenience, which means I earn a tiny bit of the sale to support this site without any additional cost to you. 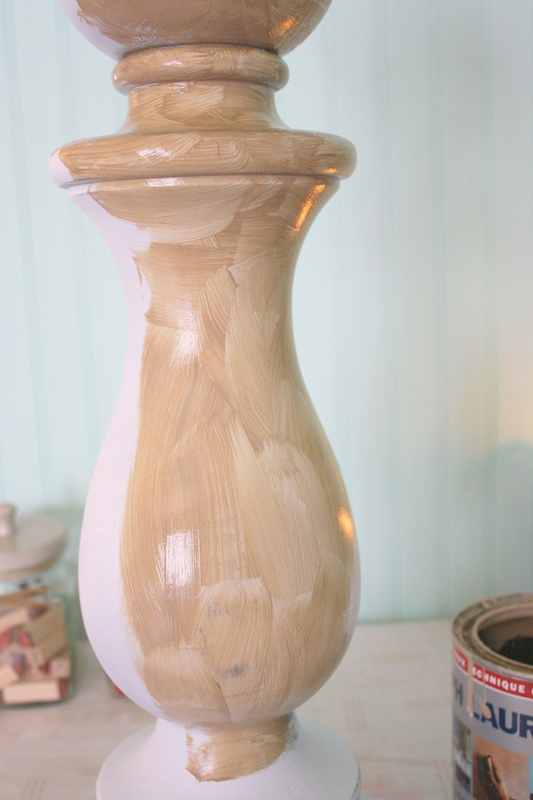 Start by giving the lamp a few coats of spray paint <– this kind works best! Let it completely dry (at least 24 hours), then distress it a tiny bit with fine grit sand paper. Next coat the base with some glaze (I prefer Ralph Lauren glaze in any tan shade). Lightly wipe off the glaze with a cotton cloth, using a circle motion. Take off small bits at a time, leaving behind enough to give you the level of distressing you prefer. If you want more, then use another layer. Let the entire thing dry overnight. Now let’s make the shade…. 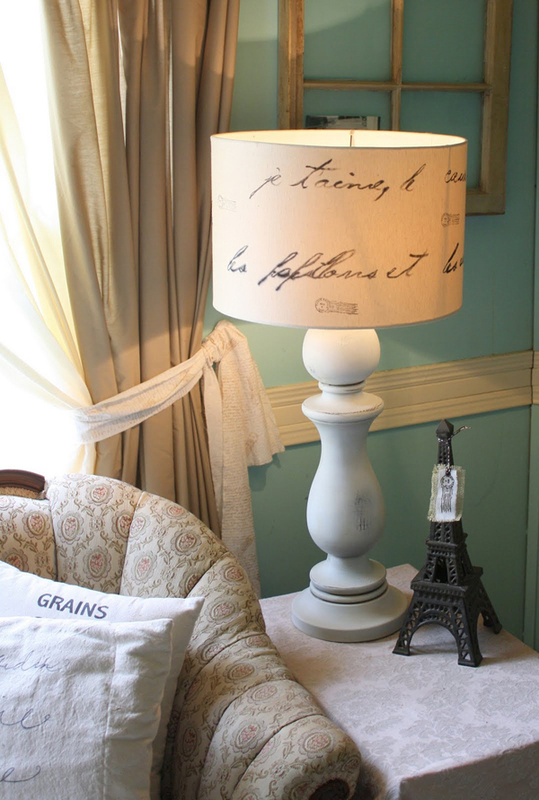 Just like with these French Script curtains, translate your favorite phrase (mine is from a love note my husband wrote me years ago, hence why I’m calling it the Love Letter Lamp), and print it off, I used this font at 175 point. 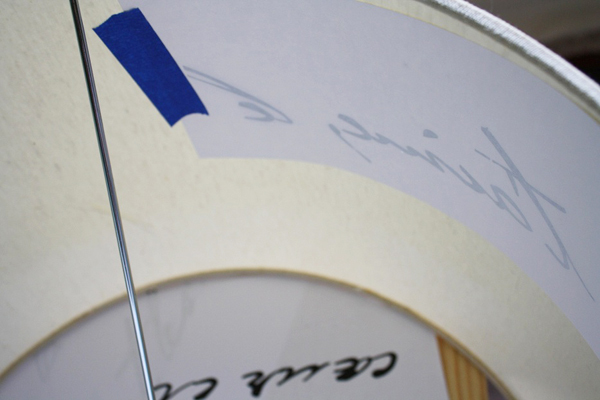 Trim your words out to separate them and tape them to the inside of the shade in whatever arrangement you’d like. Put the shade on a lamp, turn it on, and use a small brush as a pencil to trace over the words with air brush paint <– that kind is THE BEST. If you’d like to add post marks, just use some rubber stamps to make it easy. Once everything was dry, I put it all together and that’s how I created the DIY Love Letter Lamp. I like your version even better than the PB one! The shape of that lamp is great & you did a fabulous job transforming it! As always, thanks for hosting us! I am absolutely impressed with this!! It looks STRAIGHT out of a PB catalog! I’m stunned. Great lamp and LOVE the lampshade idea. That lamp is awesome! I love it too! you did a fabulous job! I agree…straight from the PB catalog! Ahhhhh!! I am in love, too! 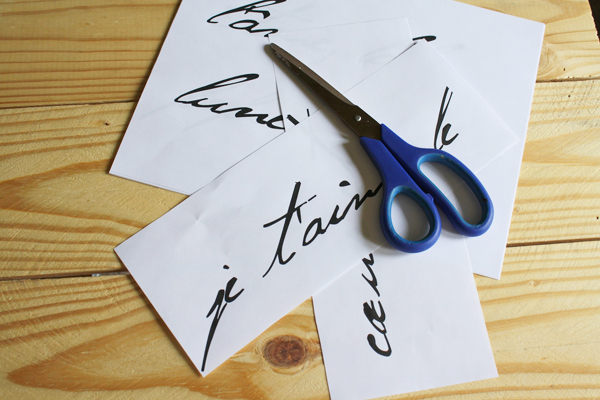 And I am LOVING the idea of taking a love note and translating it – keeps it private yet so sentimental! Wonderful job! That turned out great! 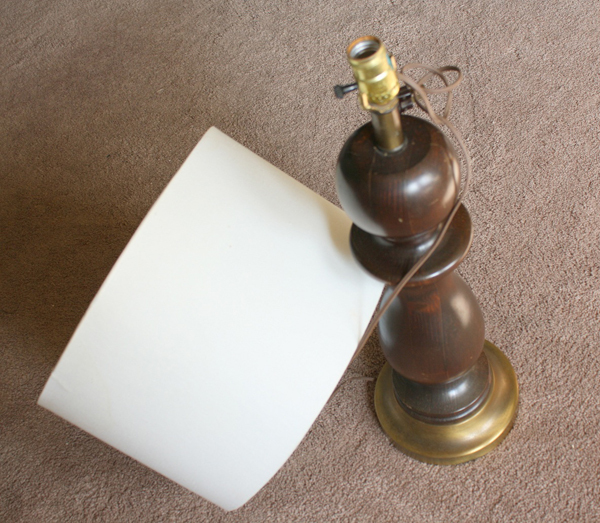 I’m working on a lamp project too….hope to link up next week! Love this party!! You did a GREAT job! I love it!!! I totally like your version better!!! It’s gorgeous! I like your version better! Oh, I’m glad to hear that I’m not the only one who drinks a gallon of sweet tea a day! Awesome…looks great and your directions are so easy to follow. Wow! I LOVE your lamp better! that lamp looks absolutely positively fabulous! The lamp turned out great! GREAT job, I too saw those and thought… Need to make it NOT spend that HIGH price! You amaze me. It looks so perfect, even better than PB. Hey, I want to go thrifting with you too. Thanks for hosting again. I would never miss it. I’ve been seeing the distressed vintage ballisters turned lamps every where now. Those lampshades are killer! Love em! I really like how your lamp turned out. You did a fabulous job! Holy COW! 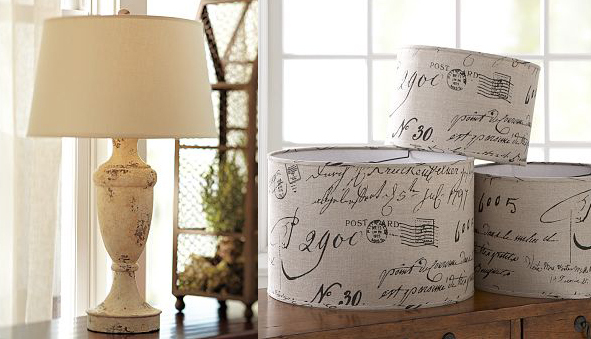 I think you just made Pottery Barn cry…cause now we don’t have to buy their lamp (tee,hee, hee). That looks great, thanks for the tut. Now that is a fantastic lamp makeover! I made over a lamp this week too but all I did was spray paint it. Still…it was a serious improvement. You are brilliant! That looks over the top amazing!!! Would you mind telling me the color on the walls behind the finished lamp? I’m in love with it!? I got nothing to post this week, but I’ll enjoy visiting the others who do! I saw that in their new catalogue and I was wondering how I could make it, too. Wow, yours is gorgeous!!! I really want to make one now! Thank you so much for the instructions. Hugs, Cindy S.
Gorgeous lamp and the price is right! Thank you!! I needed a lampshade for the office / craftroom and this is perfect!!! I love it!! Hurray…I am so excited to try it. I just love seeing what you can put together. Love the lamp. You provide such good photos and detailed descriptions. Thank you for your patience and time in doing this. I am all about PB hacking! You did a fabulous job! That lamp is gorgeous! You are so creative! This blog is definetely going to save me tons of money over the years. Thanks so much! That lampshade is beautiful. A great idea from PB – but your cheap recreation is even better! Love it and might try that, too! Wow, this is truly fabulous!! I am so loving that lampshade!!! It seems like a lot of link party ideas are pretty similar, but this is a good, slight deviation. Great job! Your lamp and shade turned out beautifully!! So creative and so much less expensive! Truly lovely! Yours turned way better I shall say! I love that idea. The lampshade is so neat and so easy. You are so creative. Clearly you are a fan of things French! Loved our trip to Paris and love your lamp and anything else PB inspired. You did a fabulous job and your how-tos are great! That is such a creative idea. I love the way it turned out! WOW! WOW! WOW! Gina, you are an inspiration. The lamp is gorgeous! Oh dear god, I love that soooooo much! Great job, I want it!!!!!!! Oh My God! I love that lamp shade as well and have been trying to find a way to make it. Thanks for the tips! I am going to run out and make it this week. I was looking at my PB catalog over the weekend, wondering how I could knock off that lamp myself! Thanks for the tips — will definitely have to give it a shot! I like yours better than PB, not only because it cost a lot less, but it just looks better – more of your style put into it. Thanks for having the under $5.00 link party- can’t wait to get some good inexpensive ideas. Absolutely wonderful lamp project. Very clever. Thank you for hosting the link party! I love this idea! Great tutorial, Gina! Positively lovely! Anything with French script wins me over. You already know I absolutely love it! Great job, girl! I need to feature this on Teach Me Tuesday. That lamp is seriously amazing!! I love it! Thanks for sharing, and for hosting! The lamp is wonderful and I am in love with the shade. Great Job! Wow! I really, really like this! I went back and re-read your curtain tutorial just so that I could be sure of how to do this. Double wow. Thank you for sharing this, Gina! That is very impressive…I love that look…and for so little money!!! Happy Valentine’s day! That lamp is awesome and you made it look easy. Thank you for the inspiration! Love this lamp. Would love to use the font for a plain sage lamp shade in my guest room. And I just discovered you are located in my Hometown. I live in VA now but was born and lived most of my life in L’burg along with other family. My Mom stills lives there. Love your site. Hi — I’m new to this, so excuse my “dumbness” here. I’m looking at the part where you cut out the phrases and taped them inside the shade. The next picture shows no outlines of the paper after you paint the shade. How did you do that? Gina, I bookmarked this darling lamp way before I was posting love links. Finally got around to Decorating Lampshades today & had to include yours! Love it! i love the tutorial thanks. You did a great job on the lamp. I am a new follower. I love this! It is totally going on my “to do” list..
Oh my goodness! I love this. I actually have that lampshade from PB, so I am doubly impressed! What a great way to have your space personalized! love it-great for gifts, to! so you used the taped printed words in the inside like a stencil? Then traced on top of the lampshade? Did you use fabric paint or markers? Its GENIUS! Thank you for showing us how to do this! Should we put some type of clear or protective coating over the lampshade to preserve the painted on words? Also, can you please recommend what material of lampshade would work best with this?